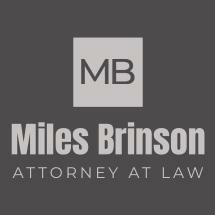 The Law Office of Miles Brinson in Knoxville, Tennessee, offers quality, cost-effective legal services in a variety of practice areas in order to help individuals and families with virtually any legal issues affecting their lives, their freedom and their future. Serving clients throughout Knox and Campbell counties and all of the surrounding areas, attorney T. Miles Brinson has years of legal experience and a diverse background that makes him well-suited to handle your needs regardless of how complex. No matter the seriousness of the charges against you or your family member, you can trust Mr. Brinson to fight hard in order to protect your rights and interests and help you obtain the most favorable outcome possible for your situation. Likewise, he and his law firm have helped numerous families navigate the difficult and emotional divorce process efficiently, saving time, money and stress for all involved, and he can help you establish your final wishes so that you can create a lasting legacy for your loved ones. To find out more about how the Law Office of Miles Brinson can best serve your needs and help you secure a brighter future for yourself and your family, you can contact him at his law firm to schedule a free initial consultation.